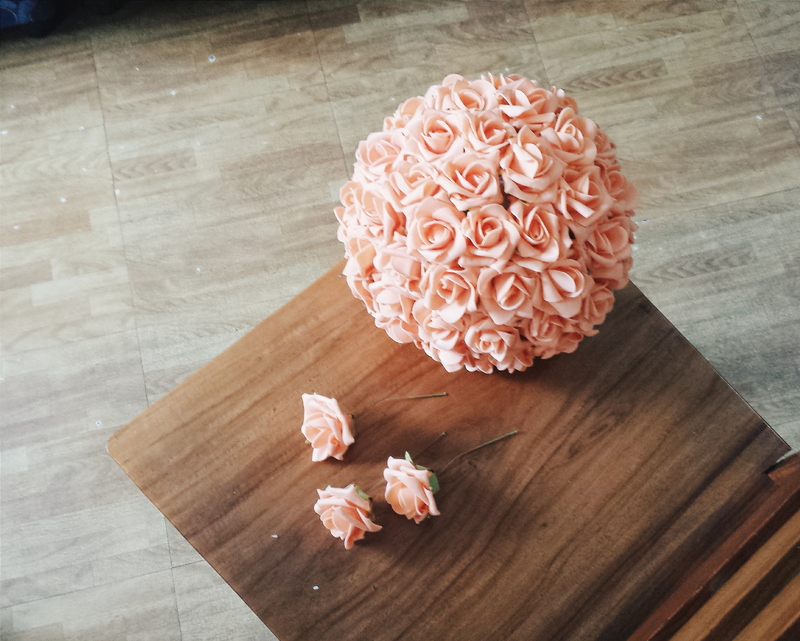 My husband and I initially wanted to have fake flowers in our wedding because we thought that it would be cheaper than real ones. The idea was to use these topiaries as reception centerpieces. The fake flowers can be found in leading bookstores, maybe even in fabric shops. But we found ours at Divisoria, along Tabora street and they’re priced at around PhP 150~ per pack which contains around 20 flower pieces. For a styro ball with a 6-inch diameter, you’d need about 100 flower pieces because you would need to stick them closely together so that the white part won’t show. It’s pretty easy, you can practically do it while watching something, and the outcome is beautiful. But we changed direction and made these as flower girl topiaries (we just added a ribbon as handle), because making these ourselves would cost as much as arranged flowers that we can just order. But if you have the time, I would definitely recommend making these, because it’s a nice touch on such a personal day. 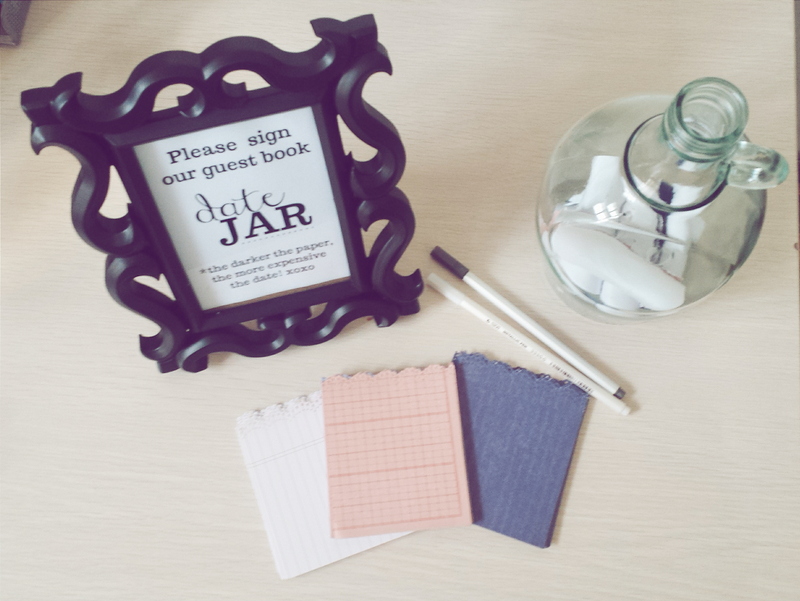 This creative spin off on the traditional wedding guestbook is super easy and super cute, and it’s something that the couple can definitely use throughout their marriage. When I found this on Something Turquoise, I immediately told Mario that I wanted to do this. The idea is pretty simple: the guests have to suggest date ideas for the couple, and the color of the paper sets the price of the date. For example, dark-colored papers contain expensive dates like dinner on a cruise ship or a weekend at a high-end hotel, mid-colored papers contain “okay” priced dates like lunch at a nearby Japanese restaurant or watching a play, and the light-colored papers contain cheap dates like street food cart hopping or star-gazing on your rooftop. This was one of my favorites in our DIY list because it’s quirky and it’s something that allows the guests to really participate in your wedding, and maybe throw you a hand when you’re stumped on date ideas. This is another really simple, really easy motif for any wedding. Just tie the ribbon around the stem of the flower, and then roll up (or shorten) the stem so that it’s hidden behind the ribbon. Hot glue the stem, ribbon and flower connections so nothing falls out. And then attach the safety pin to the back of the flower. 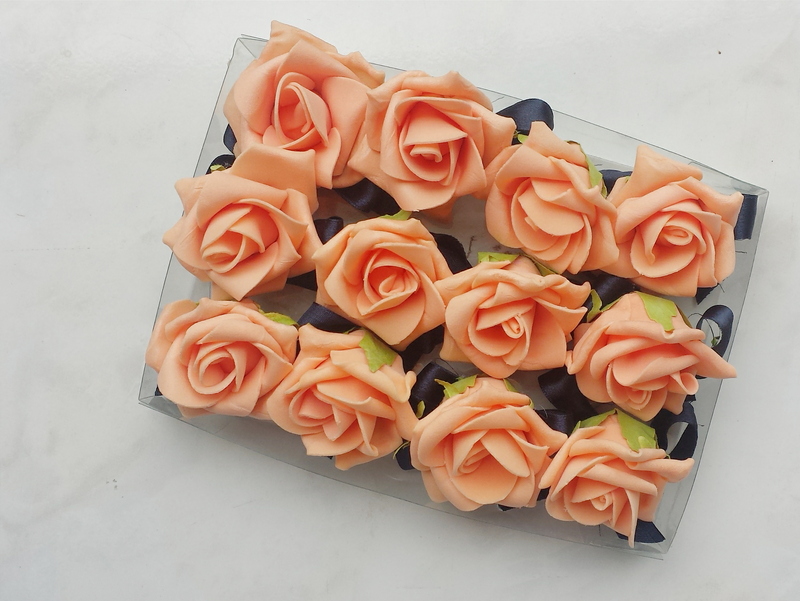 To be honest, we only thought to make boutonnieres for our principal sponsors at the last minute (so you can imagine how easy this is). We didn’t really have our wedding entourage wear the same thing — just the same color. And with that, my mom suggested to make boutonnieres to somehow separate the principals from the secondary sponsors. This is the DIY that I’m most excited about! Mario and I both LOVE coffee (our first date was at a Starbucks ha ha), so we thought that it’s only proper that our souvenir is coffee related. Assembly is pretty straightforward. I suggest cleaning the bottle and cork first, and then letting them be aired out to dry. Put on the stickers before transferring anything into the bottle. 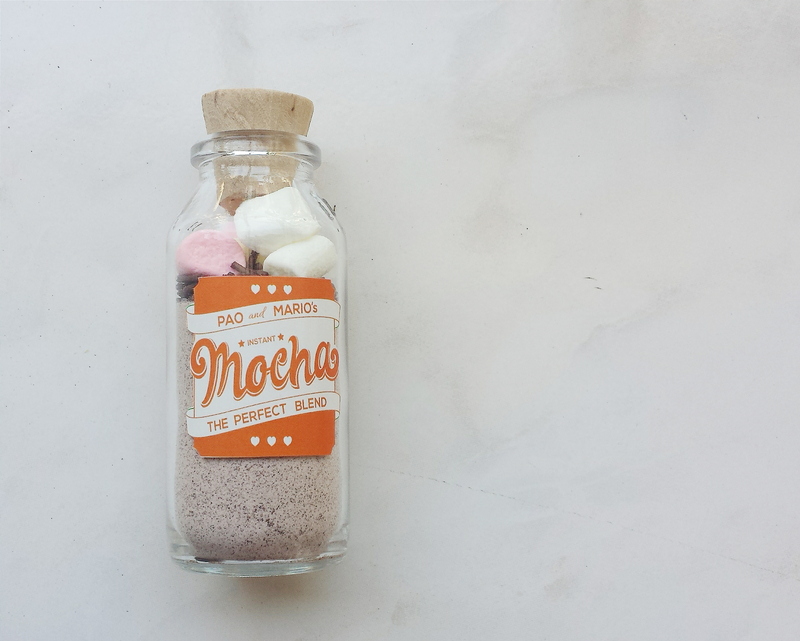 Then just fill three-fourths of the bottle with coffee mix, chocolate sprinkles and marshmallows. We actually have an instruction sticker at the back of the bottle and it says that you can use half of the bottle for a cup of hot water or warm milk, and you’re good to go!